I am back in the studio, woo hoo and desperately trying to locate my crafty mojo - I suspect it is hiding behind the large box of tissues on my desk! Yeah, I know I am supposed to be making you smile not groan - but believe me when I say that this was not the worst joke I found!! Cute card! The joke cracked up my 4 y.o. Hope you had a Happy Easter. 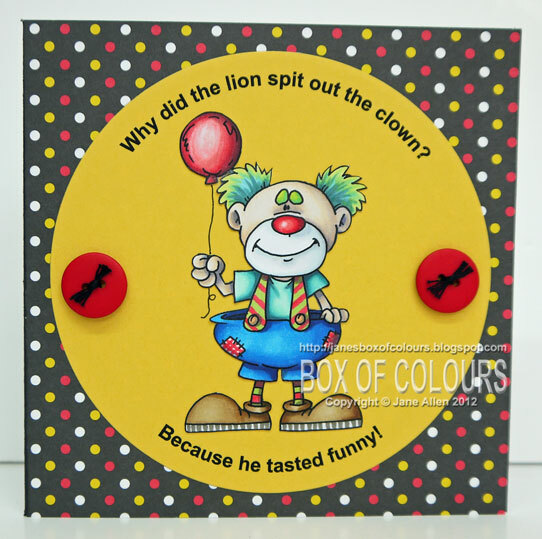 Love the colours you've used, and I know a few wee ones that would find that joke very funny! Hope you are feeling better soon. Sorry to read about that large box of tissues. I hope they become unnecessary soonest. 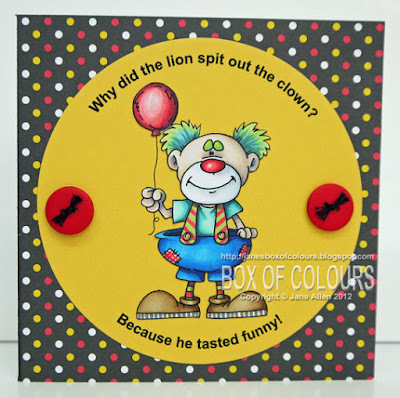 Your smile card is wonderfully color full and perfectly executed. Have a blessed Easter my friend! My 6yo daughter will LOVE that joke! LOL!! Sorry about the sniffles and missing mojo. You still do amazing work even when under the weather! A fab clean card Jane, great colouring as always. Good one, Jane! Hee Hee! Perfect clown coloring, love his hair! He he he! Thx for the giggle Jane!! Brilliant card!